RIO DE JANEIRO, BRAZIL – While most Samba schools are almost ready for the big parade starting on March 6th, G.R.E.S. Acadêmicos do Grande Rio had a major set-back and has to face the aftermath of a fire at Cidade do Samba Monday, February the 7th. The school was the most affected, loosing all of their Carnival 2011 parade items, plus the infrastructure supporting it. G.R.E.S. Grande Rio in the 2010 Carnival, photo by CMC for Carnaval.com. The losses include historical documents and the barracão’s (Samba school industrial workshop) restaurant, totaling US$8.8 million in damages, partially covered by insurance. With less than one month to go until the big Carnival parade, to recover the original parade plan is a massive task. It is not possible to recreate months of work in just over three weeks. Help is coming from the Mayor’s administration in the form of funds, and the LIESA (Rio de Janeiro’s Independent League of Samba Schools), has held an unprecedented meeting with all Samba schools presidents to consider the situation. The new plan is that the Samba schools most effected, Grande Rio, Portela and União da Ilha, shall not be judged as part of the main competition, although they will parade. LIESA’s decision, has caused some stir in Samba school world, especially amidst some of the fire-stricken schools who have voiced their wishes of being judged regardless. 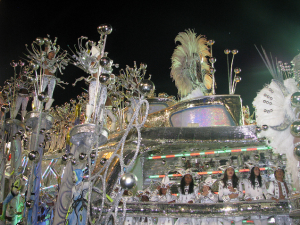 Many are pointing out that they will parade on the Sapucaí as if they were competing to win. Grande Rio is already back in business, other Samba schools have been supportive by donating materials, machinery and floats frames, which have arrived last Wednesday. By now preparations are at full speed and it is a race against time. The school started in Duque de Caxias’ – a municipality within Greater Rio – and is very young compared to most well established Samba parade institutions. Founded in 1988 it has achieved numerous titles in just 23 years of existence, becoming a fixture of Grupo Especial (Special Group) since 1993. The school is the fourth to parade March 7th at the Sambódromo. This year’s theme Y-Jurerê Mirim – A Encantadora Ilha das Bruxas. Um conto de Cascaes (Y-Jurerê Mirim, The Enchanted Witches Isle, a Cascaes Tale), is about Florianópolis the capital of southern Brazilian state of Santa Catarina. As told by Franklin Joaquim Cascaes a Brazilian artist and folk culture researcher born there. The city is located on a isle which has been shrouded in myth since the first Azorean came ashore, which was broadly explored by Cascaes giving plenty of imagery to be explored. Grande Rio needs all the support it can get and there is no better way of doing it than enjoying their rehearsals. In addition to Friday nights at their quadra, there is also a branch in Zona Sul (South zone) at Monte Líbano Club in Lagoa. More information can be found at the Eventos section of their website. Akule, maybe this is progress?